How much are we morally required to do to help people who are much worse off than us? On any credible moral outlook, other people's pressing need for assistance can ground moral requirements on us to help them--requirements of beneficence. How far do those requirements extend?One way to think about this is by means of a simple analogy: an analogy between joining in efforts to help people at a distance and rescuing a needy person yourself, directly. Part I of Garrett Cullity's book examines this analogy. In some ways, the analogy is not only simple, but politically and metaphysically simplistic. However, it contains an important truth: we are morally required to help other people, indirectly as well as directly. But the number of needy people in the world is enormous, and their need is very great. Once we start to recognize requirements to help them, when is it morally acceptable to stop? Cullity answers this question in Part II. 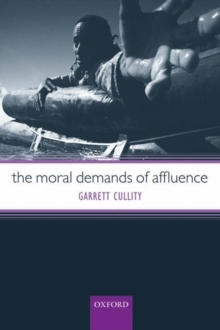 Examining the nature of beneficence, he argues that its requirements only make sense on the assumption that many of the interests we share in common-rich and poor alike-are interests it is not wrong to pursue.